I find that the holiday time around Christmas gives everyone a bit of breathing space and there’s time to reflect, more than a little bit, on life. How’s it is going and where it is going. Some of you may remember that Michael and other family members were quite sick over Christmas and this brought everything that we do here on the farm into sharp relief. We deliberated quite a bit, the pro’s and con’s, the in’s and out’s, the ups and downs, and the decision was made to close the Farm Shop. Waterfall Farm will run as before with our lambing courses, barn hire, farm tours and so on continuing as normal. The Farm Shop ran very well and was, in essence, a successful business. We won awards; both Georgina Campbell and McKenna’s Guides deemed us good enough for their high standards and we were very honoured to have their plaques in our little Shop. We managed to get our mugs on telly. Twice! Which was an experience in itself and we are very grateful for that opportunity as well. We featured in different national newspapers, a few times, with lovely complimentary articles written about us by top journalists which was really nice. The support we enjoyed from all sorts of people was humbling and we are hugely grateful for all of it. However the Farm Shop took a huge time commitment and this significantly reduced the amount of time we could devote to other areas of our lives including family, the farm work and other ventures. Essentially we were being stretched too thin and it was beginning to show, hard decisions had to made. We had great fun running the Farm Shop, we met a lot of new people, we learnt a huge amount in a short space of time and made lots new friends. All of this we will miss, but we are extremely thankful for the opportunity to have had these experiences. Overall we feel it was a very valuable and worthwhile venture. We would like to sincerely thank you, our customers, for all your support. The regulars, both local and from further a field, were wonderful and always so valued. We also had wonderful suppliers and are very grateful to them for all their support. We really felt part of the local community and artisan food producer community and will miss that. Our very best wishes and sincere thanks to everyone who helped in any small part along the way, it’s onwards and upwards to the next great adventure. No regrets, because you only live once! Once Christmas day is over all eyes on the farm turn towards our scanning day, which is usually early January. Michael would normally take his rams away from the ewes at least 35 days before they are scanned to ensure accurate scanning results. 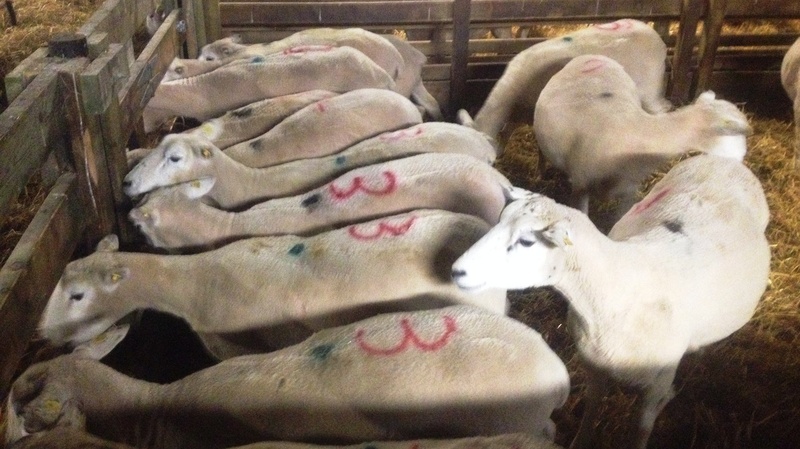 The ewes have to be in lamb around 80 days to read the pregnancy result correctly, so this year the flock were scanned in the first week of January. I find it is usually a time of nervous but good humoured tension among farmers; they want a good result and are nervous of the outcome. But really they have done all they can and can do little about the result, whatever it may be. The shed is set up in a fairly organised manner which ensures smooth, quick, efficient running of the whole operation. Firstly the ewes are run in batches into a holding pen at the top of the shed and from there they are run through a crush into a scanning crate. Sean Cooney has scanned the Keegan’s sheep for as long as Michael can remember and usually the neighbours and some friends drop by to help, it is a sort of social occasion under the guise of work! The scan literally takes a couple of seconds by running the scanner head under the ewes belly and reading the screen; the ewe is marked according to the result and released into the shed. They then get sorted into their respective batches depending on their result; twin, single or triplet pregnancies. This ensures they receive the correct amount of nutrition according to their pregnancy status. After the scanning is over all the helpers, Michael and Sean pack into our little kitchen to gobble up whatever gigantic meal I have prepared for them. Which happened to be a roast chicken stuffed with lemons, with roast veg and mashed potato on the side… But I digress. Michael was reasonably pleased with the results this year, there were very few triplet or single lamb pregnancies and the result was 1.89 which means the majority of the ewes scanned with twins. 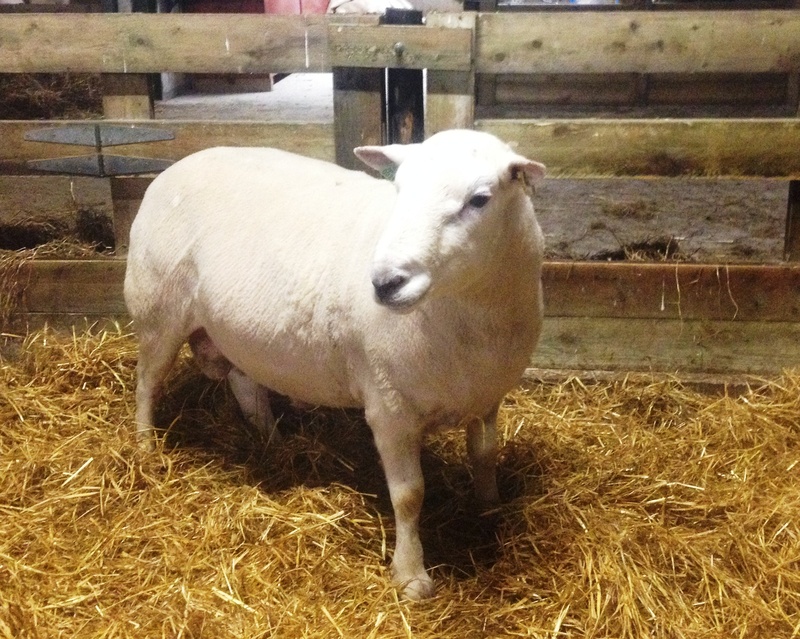 We run lambing courses which small flock owners and interested persons part-take in. They are quite popular but this year the lambing will be quite a long drawn out process so I hope everyone will get to see at least one lambing. The ewes are due to start lambing around the 8th of March and could go on for more than six weeks. One ram ran with 160 ewes and stayed with them for a longer period than usual. This was done for a couple of reasons: one; to get as many progeny as possible from one particular ram as he has very good bloodlines and also carries the ‘twin gene’. And two; This is the last year we can use him on a big batch of ewes as he is getting on in years and won’t be able for the workload next year. I think the twin gene ram knows he’s special, he looks around himself in a lofty manner and sort of puffs out his chest. I guess having that many girlfriends would make a lads head swell!! 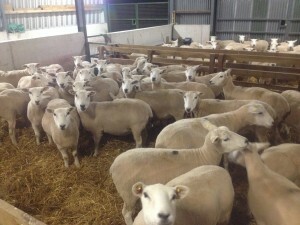 Around 20 of his ewes will have to be rescanned as he wasn’t taken away from them until about 30 days prior to the scanning. Sean will be doing that shortly, he thought a lot of them were in lamb but couldn’t be certain. I was particularly interested to see how this ram got on seeing as he had so many lady friends, but I guess 140 in-lamb out of 160 is not bad anyway. Every female lamb born to him will carry the twin gene, he’s a very good ram and Michael wants him to sire as many as possible. Michael also has 15 hogget’s who have the twin gene, by a different sire, who ran with another ram and their scan result was 2.06, 14 have twins and 1 has triplets. 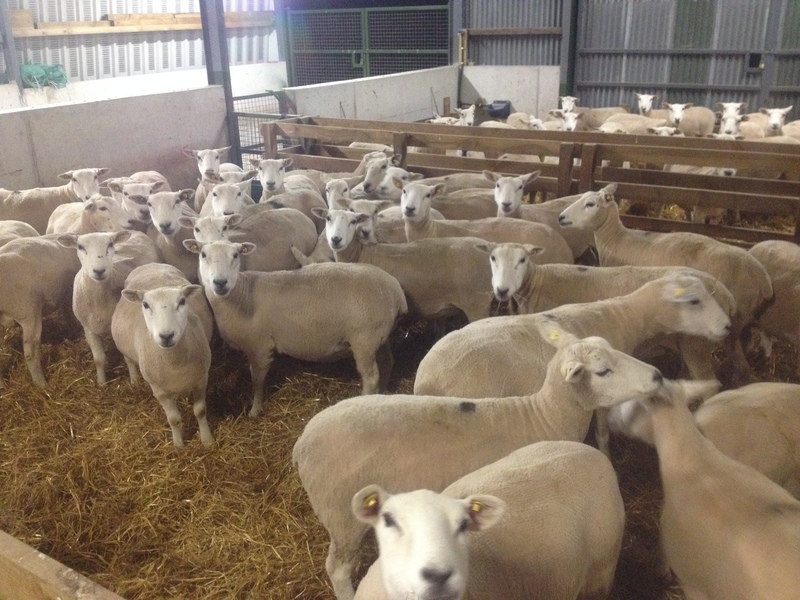 Of the 2014 ewes lambs 40 carry the twin gene and will join the main flock this year. After the 2015 lambing Michael hopes to keep as many female lambs as possible carrying the twin gene to go into the 2016 flock. It remains to be seen how well the whole ‘twin gene’ story will pan out, but with this year’s scan results Michael’s flock steps positively into the future. Farm safety is something that always plays on my mind, the thoughts of any farm accident puts me on edge. God love any family that it has happened to. While Michael does do his best to be safety concious at all times it is still a constant worry. Pat O’Keefe from the Irish Farmer’s Journal was very kind to send us this farm safety leaflet (below) which is well worth a read and certainly something worthy of promotion. Over the Christmas period when all the madness had settled down and we had a minute to think Michael and I decided it would be best not to reopen the Farm Shop after the holidays. As our regular customers are aware we are doing renovations and this is proving difficult to get done in a timely manner with our commitments to the Farm Shop, the farm and other varied areas of our lives. We felt it would be better to close the shop and crack on with things rather than dragging the renovations on and on. We would like to thank all our customers for their fantastic support and sincerely apologise for any inconvenience caused. You can order lamb for the freezer by emailing hannah@waterfallfarm.ie and completing and returning the order form. Our lambing courses this spring are filling up fast. If you would like more information please see our ‘Good to Know‘ page and don’t delay in reserving your place. Woohoo, yippee! It’s that time of year again, my favourite time, Christmas time!! This year our Christmas Market is set to be bigger and better than ever! I am very excited! We have such a super market planned, fabulous crafts stalls, delicious foodie stalls, yummy hot food, magical Santa Claus…. Let me outline it for you! We are expecting the main man Mr. Claus himself to be flying in and ready to chat to all the children from 11am to 2pm. Before he arrives there will be storytelling from one of his elves and more storytelling after he leaves. The wonderful Dublin shepherd Donie Anderson is back again this year and not only will his talented dogs be herding sheep but they will also be herding ducks. Yes, you read right, ducks! What talented collies they are. Demonstrations will be given throughout the day. We have the most fantastic food and craft stalls in attendance such as ingenious metalwork gifts made from horseshoes, hand-made pottery and hand-turned wooden bowls. You can pick up Christmas decorations, delicious home made cakes, skin care gifts, Wicklow honey, handmade jewellery, Irish owned Olive oil, artisan chutneys and relishes. There are educational toys for the kids as well as lovely children’s clothing and beautiful textiles! 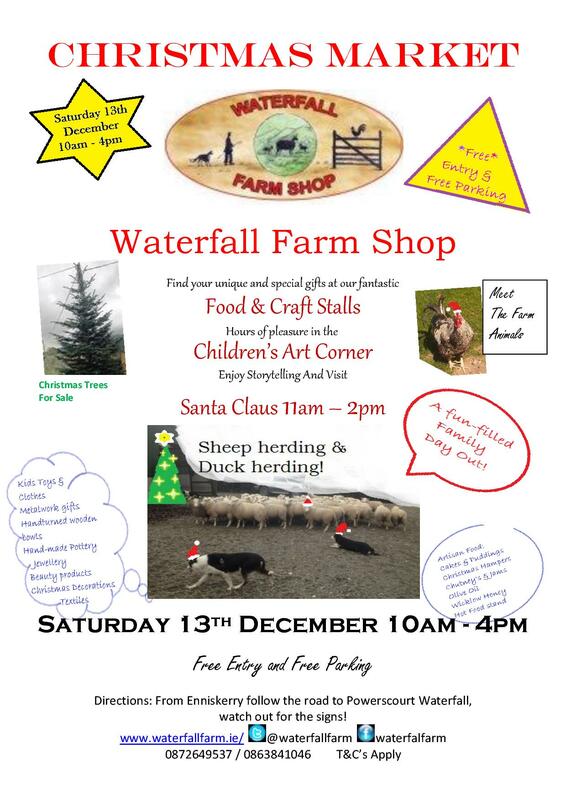 Apart from meeting Santa Claus, watching the sheep & duck herding demonstrations and listening to storytelling children can also visit the farm animals, get their faces painted and enjoy hours of pleasure in the Children’s Art Corner! The Christmas Market is indoors in our cosy Market Barn and our Combine Shed and even in last year’s atrocious weather we had a lovely day but we do advise to dress for the weather and bring the wellies! The Christmas Market runs from 10am to 4pm. Entry and Parking are free. Visit Santa Claus from 11am to 2pm. admin on A Tweet-Up with some lovely Farming Ladies! Lorna on A Tweet-Up with some lovely Farming Ladies!